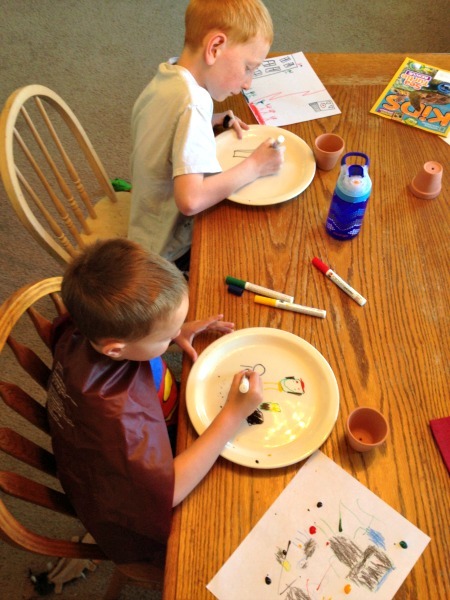 My boys have been bugging me to create their own DIY paint plates again. A couple of years ago I worked with a company that puts kids’ drawings on a melamine plate. Well, I have recently found out how easy it is to do myself (plus more safe & eco-friendly!) and my family wants updated dinnerware! I first went to Goodwill where I found a thousand plates to choose from. Boy, people get rid of their kitchen stuff! I paid $1 for each ceramic plate. 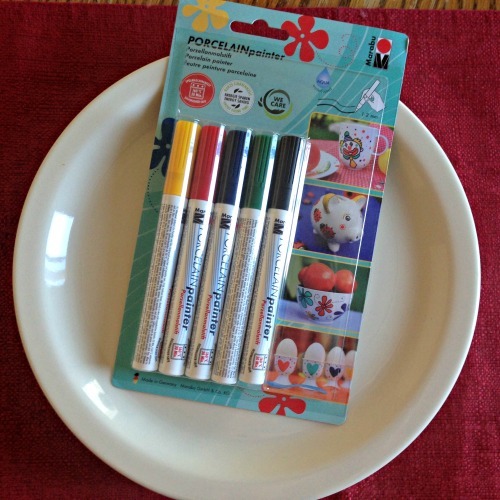 I came home and ordered Porcelain Paint Markers. I made sure they were food grade and non-toxic. That’s it! I had the boys practice on a piece of scrap paper first so they could get an idea of how their final plate would look. These are not eraseable, so that makes me a little nervous if they made a mistake. But then again, these are kid plates and everything will be cute! When they were finished I put them in the oven at 300 degrees for 30 minutes. 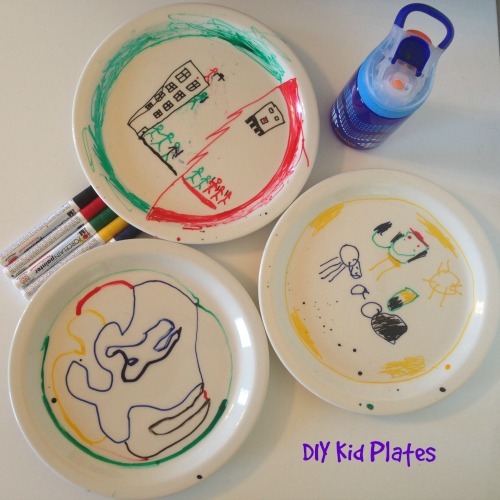 Viola DIY Kid Paint Plates! They were done and now dishwasher safe too. Wouldn’t these make fabulous gifts? Hint hint Mother’s Day is coming up! You can also paint mugs, bowls, anything! Did you spy our AUTOSEAL Gizmo Sip from Contigo? P’Diddy’s (or should I say Superman’s?) favorite new water bottle. If you recall, I posted about the AUTOSEAL Travel Mug last year and we still love love it. So excited to now see a water bottle for the kids with the same technology. No more spills or mess from this leak-free bottle. See how P’Diddy has his fingers on the orange spot? That is the button you push when you want a drink. It opens up the valve. As he sets it down his fingers come off the button and the valve closes. If it tips over, then no worries because it AUTOSEALed! Great handle loop. That is very important to us because we carry them when we hike! And I can’t forget to tell you about the easy-to-clean lid. It has an extra button inside that lifts up so you can simply clean inside the spout. I do wish it was insulated, but it is bpa-free which is super important. O’Bear is a bit jealous of this ‘cool water bottle’ his brother now has! Will you create DIY Paint Plates now that you know how easy it is? I partnered with Contigo for this post. All opinions are my own and links are affiliate. I really like the auto seal feature and the lifetime guarantee! I have several adult Contigo products and love them. The thing I like best is the high quality of the products and great customer support of Contigo. The auto seal feature is awesome—having plenty of experience with spills and leaks from tipped over bottles, it's something I especially appreciate. I like the auto seal. I love the colors of the cup! And awesome project - I keep wanting to make coffee cups like this - I have always just used sharpie markers (b/c you don't eat off the outside! LOL), but they eventually wash away. Good to know about the porcelain markers!! I love that this cup is 100% spill-proof! I also like the neat carry handle with soft grip. I like the AUTOSEAL technology. Love the Purity Glass Water Bottle. I love that it's BPA free and auto seals! I like that it has that little loop on it and can be attached to dd's lunch box! LOL We have a few of their kids water bottle/cups for dd but they don't fit in her lunchbox and have no way to be attached to it either! I love their coffee mugs too! Hubby and I both have one! I love the auto-seal on our Contigo products. contigo is my favorite water bottle, really the only one I like to use. The kids one would be great for my daughter to take to school. I love that it automatically seals between sips! I have a Contigo water bottle and I love that it doesn't leak. I like that this cup seals between drinks and is BPA free. I'm a... well I can be a strict G-ma at times. You would think the opposite but nope. I did my time of putting up with horrid messy cars and living room. Now, I lay down the law. NO eating or drinking in the living room or my car, sorry kids. BUT I will allow a drink in a sippy that doesn't LEAK. What good is a travel cup that leaks? I would like these. i love the different sizes and styles of Contigo the most. I love that it does not spill. I babysit my little niece and she has a cup now that my sister sends with water and it spills. She loves spilling it on my hardwood floor and playing in it, I would use this for her. Little snot. LOL!!! I love that it is 100% spill proof! I love that it automatically seals between sips to keep from having spills. 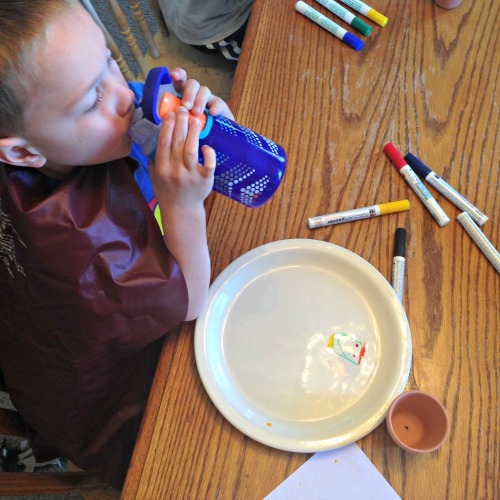 I love that it is BPA-free bottle and spill proof. I like the bright designs and the easy clean lid. I love that the Gizmo Sip is 100% spill-proof and leak-proof! I love the stylish design and the ease of use. I love the auto seal feature! And that it's BPA free. I like their attention to detail backed by the Contigo Limited Lifetime Guarantee. I like that they're leak free. i love contigo durability, colors, and the autoseal feature! I love that they offer a nice selection of products for my whole family to enjoy! I love that they seal! and I love the designs! Well of course we love that it is leak proof, but also that it is suitable for kids of all ages and comes in many designs that any child of any age would like! Contigo products are very sturdy and weel built! I like that it locks with no spills! Great for little ones to use. Loving the seal and.no leaks! Sick of them around here! Hi! I really like that it seals between sips. Such a cool feature! I like their products because they're so well-made and colorful. Thanks!! I like that the Gismo Sip automatically seals between sips. Oh I really love that it has the 100% spill-proof! I dont know how many times we have had spills, and would be so nice to know...that it would not leak!!! I love the spill proof lids! I love that it locks, and is leak proof. A must for my lil man. We have a couple of the Autospout Contigo kids cups and love that they are truly spill proof. I love that they are safe and do not break so easily! I like how the Autoseal prevents spills. I like that the bottle is spill proof. I love that it's leak free! I love all the different designs and how cute they are! What I like most about the Gizmo Sip from Contigo is it's AUTOSEAL technology that allows for mess free drinking with my kids. I love the durability of their products! I love that it automatically seals - no spills in the car or in the bed! Anything that is spill proof is my favorite, I love that about these bottles!